in the presence of a wide range of strong d.c. electric fields, by means of Molecular Dynamics Simulations. The objective was to give a detailed description of the hydrogen bonding pattern and dynam¬ics and an account of the mechanism through which the electrofreezing process occurs. 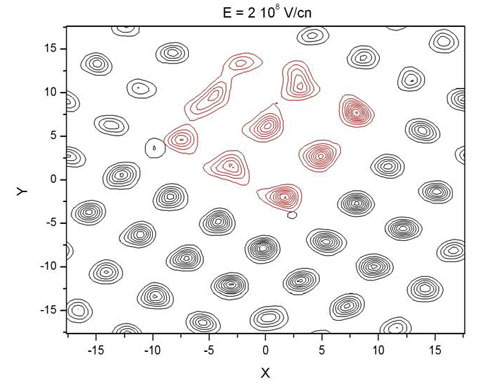 1) the existence of a structural phase transition at a field value around E c1=1.5 10 7 V/cm, which was found to signify the cluster elongation along the field and the molecular dipole moment alignment from random directions to directions less than 90 degrees with respect to the field vector. 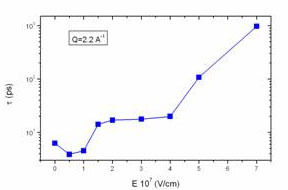 A second phase transition at a higher field value, E c2=5 10 7 V/cm was found to correspond to the transition to a quasi-crystalline state. In both cases, i.e. 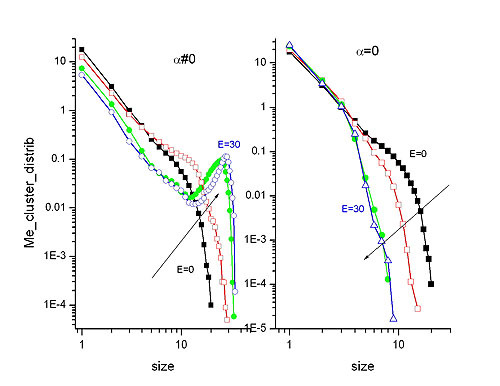 at E=E c1 and E=E c2, structural relaxation times displayed abrupt jumps. 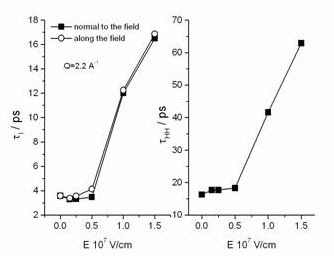 2) the transition from a solid-like to a liquid-like phase for relatively weak electric fields, about E=0.5 10 7 V/cm and then back to a solid-like structure for stronger fields. This transition was manifested in the enhancement, relatively to the zero field case, of the structural and reorientational relaxation rates, of self-diffusion coefficients and of molecular mean vibrational amplitudes, the same way as it was observed to occur in supercooled water under a relatively weak external pressure. 3) the appearance of a novel structure at moderately low fields, ~1.5 107 V/cm, consisting of a number of incomplete cubes stacked one upon the other at one edge of the cluster and grown along the field direction. 1. ''A Molecular Dynamics Study of Structural Transitions in Small Water Clusters in the Presence of an External Electric Field'', A. Vegiri and S. V. Schevkunov, J. Chem. Phys. 115, 4175 (2001). electric field'', A. Vegiri, Mol. Liq. 110, 155 (2004). 1) A similar structural phase transition, like the first one in water clusters, was also observed to take place at a particular transition field of about 1.0 10 7 V/cm, signifying the flipping of the molecular dipoles to directions along the field. Because of computational demands, the strongest electric field examined was equal to 1.5 10 7 V/cm. Unlike to clusters, the application of relatively weak electric fields did not seem to enhance the liquid character of water. 3) Dynamical quantities such as power spectra, mean square displacements and mean square vibrational amplitudes were found to display substantial anisotropy with respect to the field direction. Thus, hydrogen bonds were stiffer along the field than along orthogonal directions. Related to that, mean square vibrational amplitudes for the in-cage motions and diffusion coefficients were found to be more restricted along the field direction. However, hydrogen bonds were found to become weaker with increasing electric field. methane molecules with α=17.54 a.u. In the first case, the solute does not interact directly with the field, whereas in the second case methane molecules interact with the field and the adjacent water molecules through dipole (water)-induced dipole (methane) interactions. 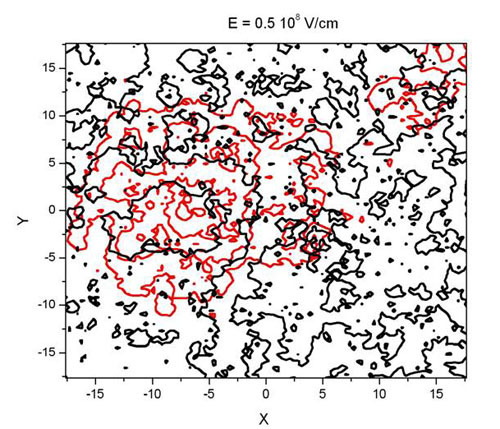 The degree of clustering is shown in the following figure. Electric field values are in 10(^7) V/cm. In the right frame, where polarizability is taken equal to zero, the electric field increases the dispersion of the methane particles, whereas in the left frame, association of all particles into a big cluster is clearly favored. The next two graphs show the density profiles of the methane-water system for two different electric field values and for the α?0 case. Notice the complete phase separation and crystallization.